Suggestion Box is a unique app for improvisers and storytellers. Now on Apple Watch. We are pleased to announce the release of version 2.0 of “Suggestion Box“, our app for improvisers, and storytellers. You can also use the app when playing charades and similar games, or to help with fresh ideas when you want to tell your child a story at bedtime, or work with them to create their own story. Just tap any of the colourful buttons to see a suggestion from that category. The revised app now includes support for iOS 8 and the larger display sizes on iPhone 6 and 6 plus, as well as iPad. 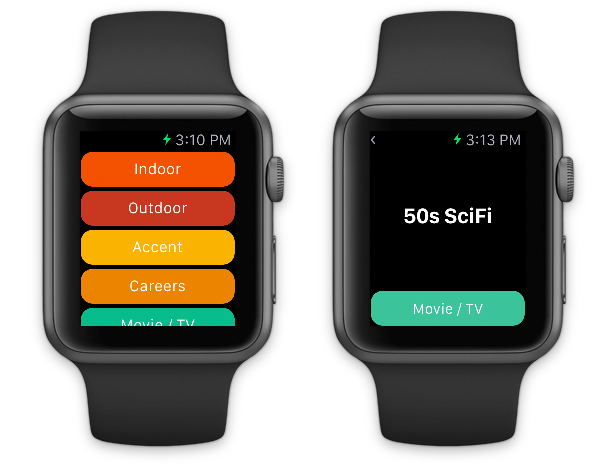 It is also our first to include support for Apple Watch, allowing you to get suggestions from the entire list featured in the main app, directly on your wrist. Suggestion Box works with iPhone 6+, 6, 5S, 5c, 5, 4s, iPad, iPod touch and Apple Watch, and is available now on the App Store.